After a doctor bandages the wound of a patient, the only way they can monitor the health of the wound is when time comes to replace the bandage. In this time of wearable technology when so many things are constantly monitored, you may wonder why is it so hard to monitor a wound? Well, it seems your bandage could soon be powered by technology. A team of researchers from Tufts University, Harvard Medical School, and Purdue University have shared a prototype of a smart bandage that can monitor chronic wounds and deliver drugs to improve healing. This technology would efficiently transform bandages from a passive form of treatment into an active part of the healing process. The bandage has been built for chronic skin wounds resulting from burns, diabetes, or other non-traumatic conditions. Diabetes and burns can cause chronic skin wounds, which often results in infections that lead to amputations. A recent study has shown that almost 15% of Medicare beneficiaries had at least one kind of chronic wound or infection. These types of patients tend to be older and aren’t capable of taking care of themselves fully. 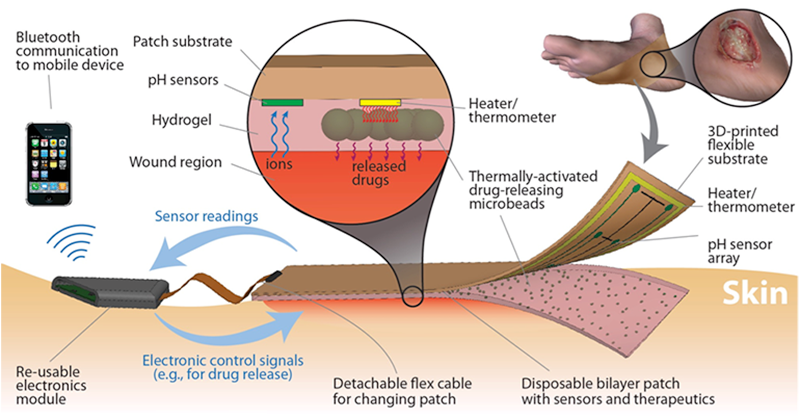 The smart bandage has two parts: the bandage itself with pH and built-in temperature sensors and drug releasing microbeads; and the other part is a separate electronic module connected to the bandage via a flexible cable. The latter part scans what the sensors are measuring and signals for the drug to be released. pH is an important component in monitoring the healing process of a chronic wound. In normal healing wounds, a pH ranges from 5.5 to 6.5, while non-healing infected wounds have pH greater than 6.5. Additionally, temperature indicates inflammation in and around the wound. The built-in sensors in the bandage help regulate these conditions. The researchers successfully tested the bandages under in vitro conditions. Now, they’re conducting pre-clinical studies to find out if the smart bandages have a clinical advantage in improving healing when compared to traditional bandages and wound care products. The study was recently described in the journal Small.